Ray Blackston of Greenville, South Carolina, worked as a buyer and a broker for eleven years before cashing in his modest 401k and leaving his corporate cubicle to write full time. He serves on the missions committee of his church, has traveled to rural Ecuador on a summer missions program, and coaches his seven-year-old nephew, Action Jackson, in T-Ball. Please press the Open Book Widget to read the first chapter. I've been working overnights and literally the only time I get to read is during my 1/2 hour break. That said, I've been breezing through this book. I'm not finished, but have really enjoyed reading it. I have no idea where it's going and how it's going to come full circle, so he's got me hooked. Ray Blackston has a certainway with words (which is good for an author). He gives just that little bit more of detail to make you feel a part of the moment. He's created solid characters in Kyle and Gretchen. Meeting Kyle's family is an experience, for Gretchen, as well as the reader. These two people have nothing in common aside from the fact they attend the same college. After graduation, their lives take opposite directions. How, and if the two will be anything more than friends remains to be seen. I have never been to the lonestar state. But I have heard lots of good things about it. I'd love to win this book! And even though I wasn't born in Texas, I've lived here a total of 10 years, this last time for 16 months in the very tip of TX, south of the immigration check point! If I win, please contact me at WillisWay (at) aol (dot) com. Thanks bunches! I grew up in Texas (top of the Panhandle) and lived in the Dallas area a number of years while our kids were young. Two of my 4 boys were born in Texas. Even though I've been back in Oklahoma for a while, I miss the Lone Star state. Fabulous place. Please enter me in the drawing--I'm a fan of Ray Blackston and didn't know he had a new book out. Nice surprise. The book sounds really good, please enter me in the drawing. I have never been to Texas. I want to someday. 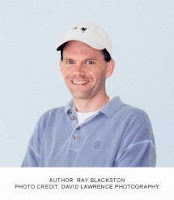 Ray Blackston's books are so much fun to read, so thank you for this giveaway. I've never visited the Lone Star state, but would love to. My daughter and her family are in Austin... I love to visit Texas! Please include me in the drawing. Thanks. Never really been to Texas (I don't think a stop in the airport counts!). But my sister lives in Galveston so I hope to make it there someday soon. I have enjoyed Ray's books in the past. Thanks for the giveaway. Is it too late for this draw? I love Ray's novels. I have to read his books when on holidays...easy and light and so much fun!!! We lived in Texas many years ago for 2 years. We were in the Dallas area. Would love to give this author a try. I finally found a name drawing program called: The Hat. Today is my first day using it and I can't believe I still feel terrible that not everyone wins!! Anyhow, todays winner is "Carole"!! Send me your snail mail and I will get the book sent out to you! Congrats.